I CHARGED DOWN THE FINAL STRAIGHTAWAY toward the “Mile 3” sign, hearing nothing but my own heavy breathing. Behind me, somewhere, were close to 800 other runners. Ahead was one lone runner – and the pace bike. My mind was flashing between two thoughts: Keep going – just hold it together a little longer – and, What the *&%! am I doing in second place??? The answer, near as I can tell, is either that wine drinkers don’t run particularly fast, or that the fast ones didn’t get up early enough to run a morning race. 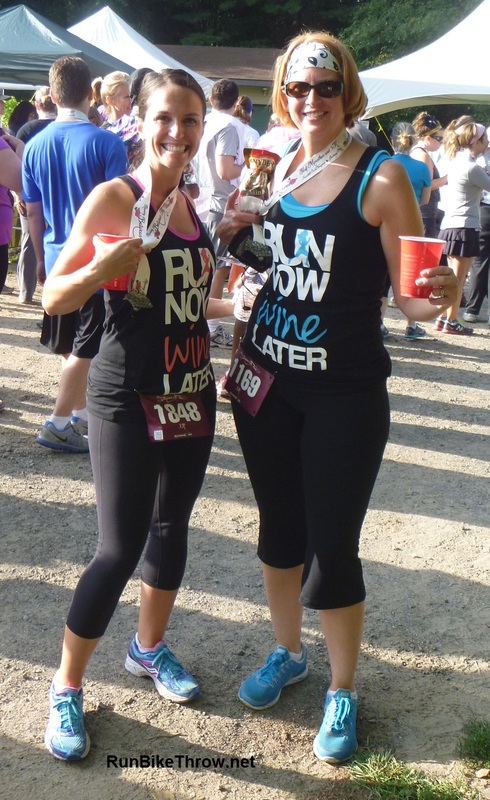 Last Saturday’s Running Between the Vines race was the second in the Running Fit “Thirsty 3” series. 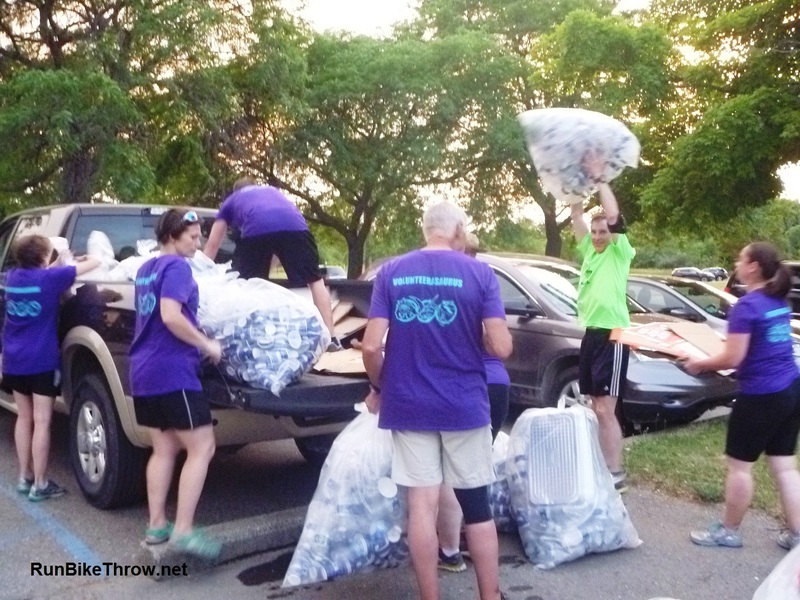 The first, the Hightail to Ale in May, brought nearly 4,000 runners to Detroit’s Atwater Brewery to run a 5K along the Riverwalk (and a line at least that long to get a post-race beer). 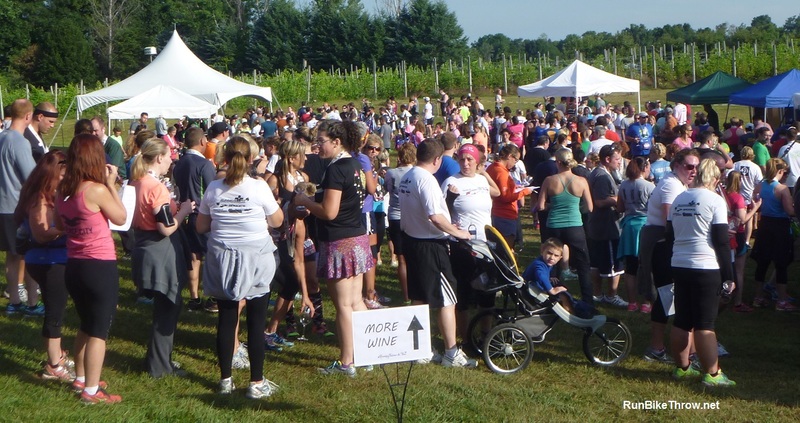 Saturday’s race at the Sandhill Crane Vineyards just outside Jackson split 1,400 runners between a 5K and a half marathon, with wine and food tasting afterward – an event aimed at a more refined and sedate type of runner. Okay, never mind what I just said. A long wait for parking was the only glitch in an otherwise perfect day and well-run event. The half marathon started on time at 7:30 a.m., despite many runners still parking or standing in the porta-john lines. No harm done, as it was chip timed, but I was grateful I’d chosen the 8:00 5K and had a half hour to get loose. God + wine: a classic pairing. Having completed a triathlon just three days before, I left my “hard run” vs. “fun run” decision to the last minute. Then I thought what the hell and worked my way to the front of the line. “Go, rabbits,” someone said laconically as the horn sounded and we sprinted into the first turn. Wine drinker, obviously. Our route went through a restricted neighborhood which opened its gates for us. Tall and solid gates, not some half-assed toll booth lever. Wine drinkers are apparently perceived as upright and trustworthy, although judging from the paucity of spectators, not worthy of much attention. I was in the lead group, but I fully expected people – lots of them – to overtake me. Instead, incredibly, I was overtaking others. Before long I was in fourth place. Then third. At the one-mile mark I passed the next guy. I was in second place, and the pace bike and front runner were clearly visible ahead. I’ve had top 10 finishes in trail races, but never in a road race. This was something entirely new – and unbelievable. As I ran through the water station at the halfway mark I heard voices and footsteps behind me, but taking a page from Satchel, I didn’t look back. The Mile 2 marker came and went. I was holding second but not gaining on the leader, who remained about 20 seconds ahead. I had a decision to make. Should I go balls out and try to catch him? Would I ever have a better chance to win a race? But if I did, I might crash and burn, spoiling what promised to be my best-ever finishing position. Coincidentally, I later came across this New Yorker article about Alberto Salazar, a world-class runner in the 1980s, and his ability to push through pain and exhaustion to win races. The author (Malcolm Gladwell – yes, him) recounts his own “balls out” moment as a runner, and concludes he is not like Alberto Salazar – it was not worth it to him. Unknowingly, I’d reached the same conclusion. Second place would be good enough. Down the final stretch and back into the vineyard. The finish line appeared, and I surged through it. Second overall! The third place finisher was only six seconds behind. I wonder what his thoughts had been regarding me? And the crowd goes wild! Er…the one guy watching tips his glass at me. 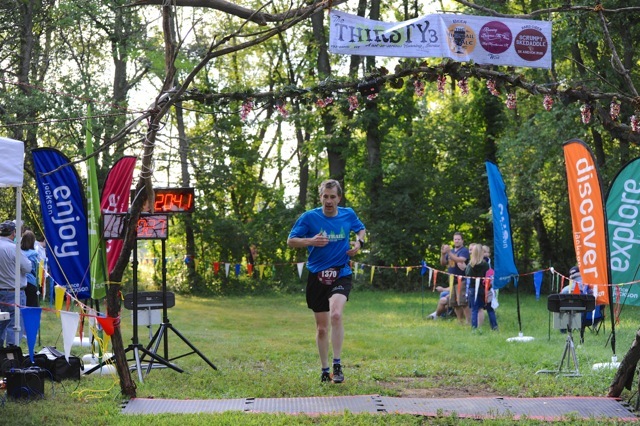 In the spirit of full disclosure, my time of 20:38 would have been buried way down the list at the Hightail to Ale 5K, where the top 5 finish times were under 18 minutes. But that’s what races are like. It isn’t the fastest runner who wins, it’s the fastest runner who shows up that day. The post-race wine and food tasting was surprisingly good. Even though I don’t drink much wine, I liked their Pinot Grigio so much I bought a bottle. I’d won a nice wine bottle carrier and needed something to fill it, didn’t I? Here’s what the people really came for. The final in the “Thirsty 3” series, the Scrumpy Skedaddle, is Oct. 5. 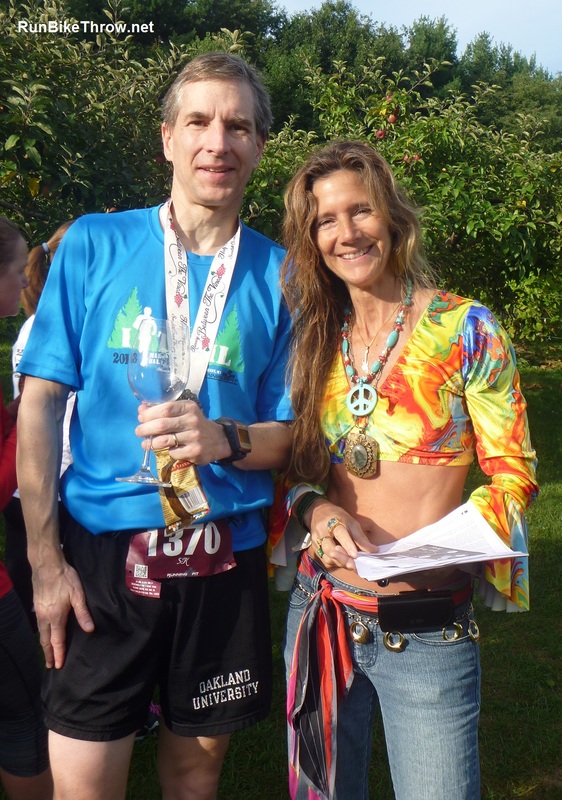 I wonder how cider drinkers compare to beer and wine drinkers in a 5K. I’ll be sure to let you know. 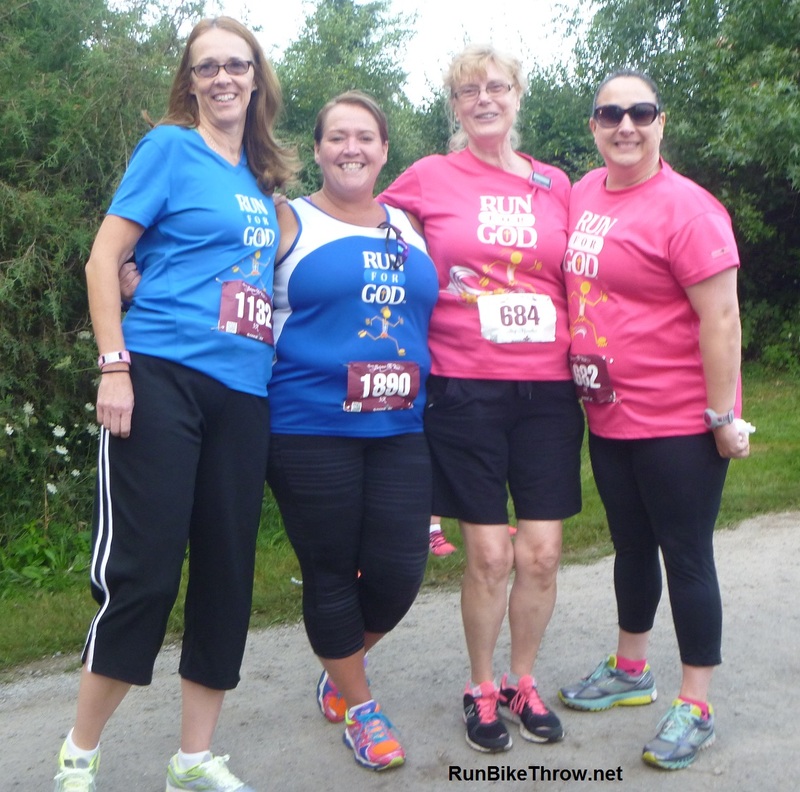 And let’s not forget Run Woodstock – less than 3 weeks away! 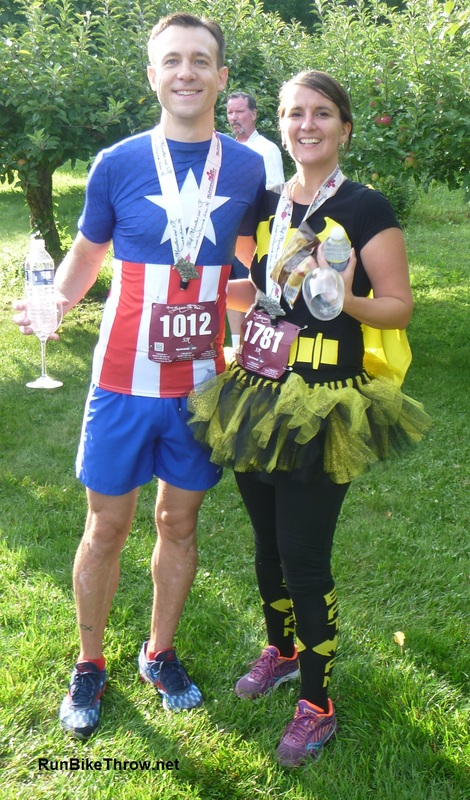 This entry was posted in Run Woodstock - 2012 & Beyond, Running & Cycling and tagged 50, 5K, fitness, race recap, Running, Running Between the Vines, Running Fit, Sandhill Cranes Vineyard, second place, Thirsty 3 series, wine. Bookmark the permalink.